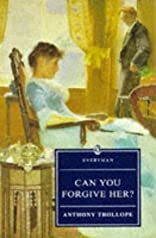 Home > Books > Can You Forgive Her? "Can You Forgive Her?" initiates the series of six Palliser novels in which Anthony Trollope reached the height of his literary powers. About Anthony Trollope (Author, Editor) : Anthony Trollope is a published author and an editor. Some of the published credits of Anthony Trollope include Rachel Ray (Penguin Classics), The Eustace Diamonds, Barchester Towers.